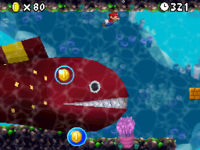 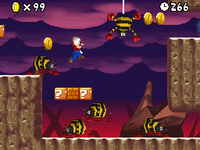 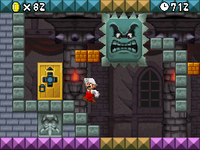 World 8 is the final world of New Super Mario Bros. Mario and Luigi travel to this world after defeating Monty Tank or Lakithunder, or using the cannon in World 5. 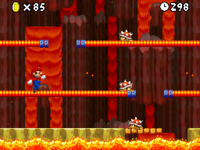 This world is divided into two parts: a "dark forest" area, and a "lava" area; both having their separate towers and castles. 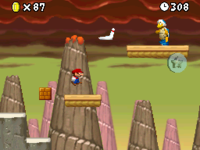 The two bosses of this world are Dry Bowser; and a resurrected Bowser fighting along with Bowser Jr. 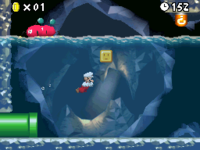 Unlike all the other worlds, this world does not feature secret exits or unlockable courses. 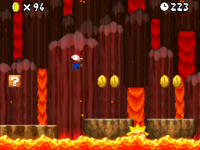 One of each type of Toad House can be found in the forest area, but none can be found in the lava area. 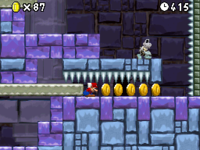 When Mario enters the second part of World 8, additional drums and a double-reeded flute are added while roaming in the map. 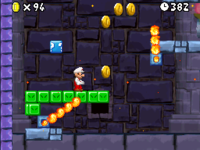 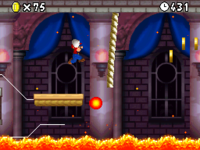 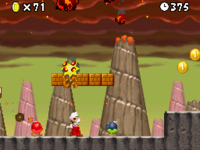 This is one of the two lava-themed worlds in the New Super Mario Bros. series to feature Toad Houses, the other is World 6 from New Super Mario Bros. 2. 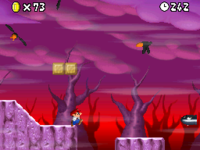 This page was last edited on December 18, 2018, at 03:40.